I’d almost forgotten how much I enjoy live music. Isn’t that terrible? I just don’t keep up with shows that come through town because I don’t have a default music buddy to go with me. Last night, Jordan texted me as I was photographing this salad with a super last-minute, free ticket to see Ok Go. Since I’m “the friend who’s up for anything!” I drove right there to meet them. And it was AWESOME. Few sights fill me with more glee than watching others jam out in their own element, and Ok Go really jammed out. The visuals! The dancing! The brilliant, unique, goofy determination and talent behind it all! That’s self-actualization at its finest, not to mention most entertaining. I loved every minute of it. I experience the same tizzy awe every time I crack open a book created by a friend. The newest arrival is The Easy Vegetarian Kitchen by Erin Alderson of Naturally Ella. It’s a cookbook that offers fifty base recipes, each with four seasonal variations, for a total of two hundred. Erin is a recipe-creating machine and I love having a tangible copy of her hard work. Erin asked me to help her test out the recipes for this book last year and this salad was one of them. Now that I can share it with the world, I just couldn’t resist. 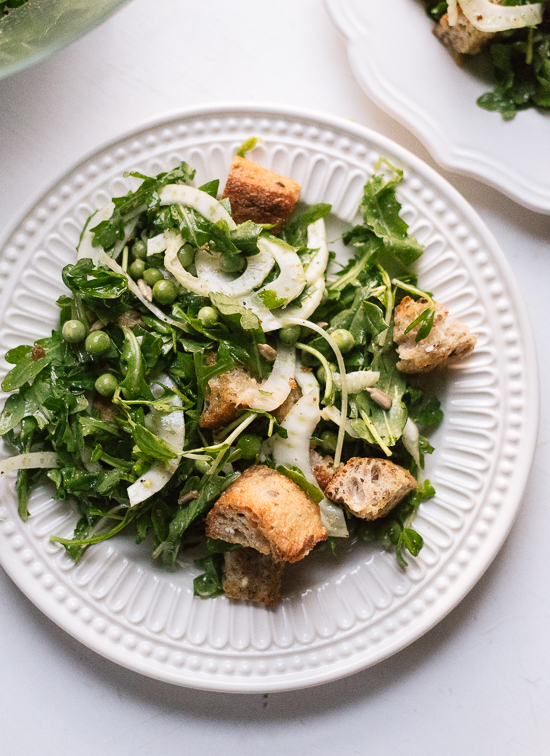 This spring panzanella features fresh greens, raw peas (which are really good!) 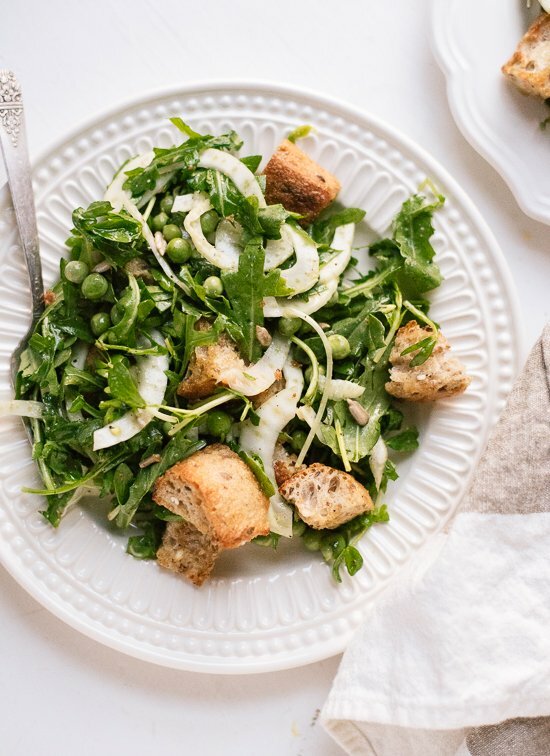 and pea shoots (found at Trader Joe’s), thinly sliced fennel and freshly baked, whole grain croutons tossed in a lemony dressing. Her final recipe calls for minced garlic scapes, which are green onion-like shoots that grow out of garlic if you let them. I used pressed garlic instead. Congrats on a job well done, Erin! 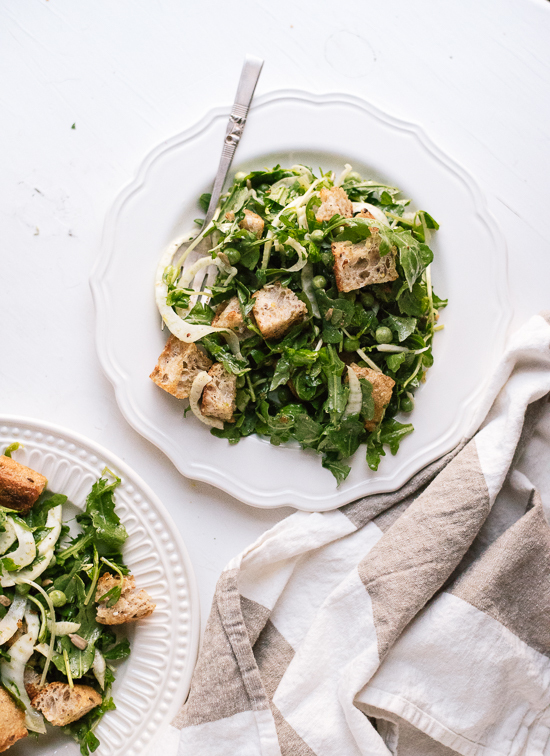 Fresh panzanella recipe for springtime! Panzanella is a traditional Tuscan salad. 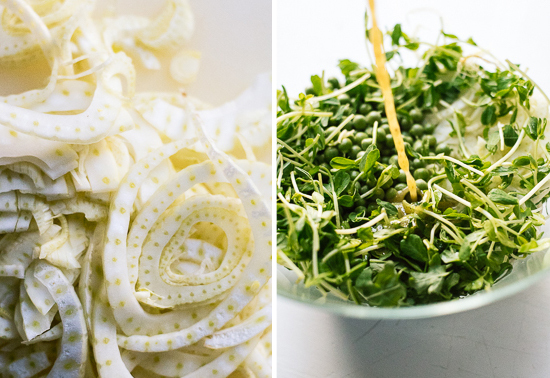 This spring green version features fresh peas, pea shoots and fennel. 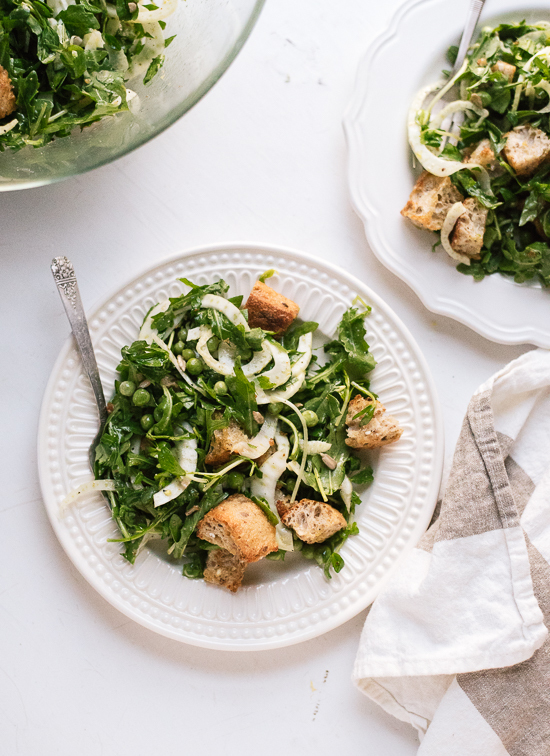 If you intend to have leftovers, I suggest storing the greens and croutons separately from the rest and tossing it all together just before serving. Recipe yields 2 generous portions or 4 side salads. Preheat oven to 375 degrees Fahrenheit. Line a large, rimmed baking sheet with parchment paper. On the baking sheet, toss the cubed bread with the olive oil, salt and pepper. Bake for 12 to 14 minutes, until crisp. 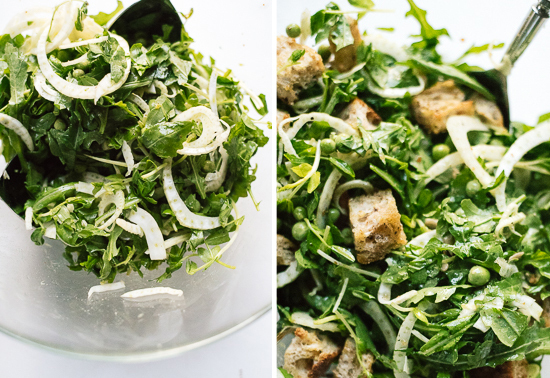 In a large serving bowl, combine the roughly chopped greens, sliced fennel, fresh peas (yep, they’re raw! ), pea shoots and sunflower seeds. Whisk together the dressing ingredients until emulsified. Drizzle the dressing over the salad mixture and toss to combine. Once the croutons have had a few minutes to cool down, toss those in as well and serve. Recipe adapted from The Easy Vegetarian Kitchen by Erin Alderson. Make it vegan: Simply use maple syrup or agave nectar instead of honey. Make it gluten free: Use some great gluten-free bread in place of the whole grain bread. Ah, I love fresh spring peas! What a beautiful salad to celebrate the season! This salad is such a beauty. Pinning it now! I’ve been going through her cookbook and trying to decide what to make, but it isn’t easy! So many good looking recipes to choose from. Ironic, I’m heading to Trader Joe’s today and pea shoots are on my list. Maybe this salad should be too. It’s a beauty. Really?! Soaked bread, I’m intrigued! Valentina, thanks for sharing! Your photos are so lovely and your frise looks terrific. 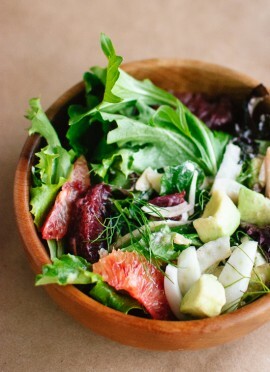 What a beautiful salad and so lovely for spring. I love the concept of Erin’s cookbook, how creative! 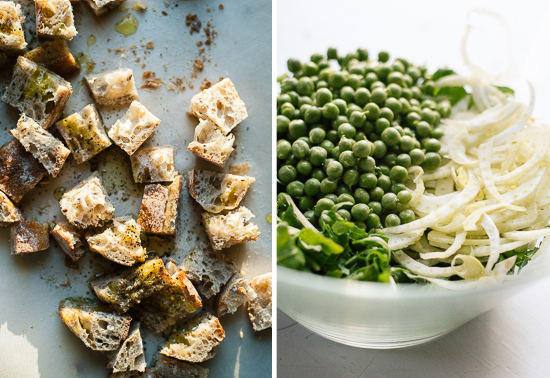 I can’t wait to make this when fresh peas become available. I love them raw too. In fact, all the ingredients in here are favourites! 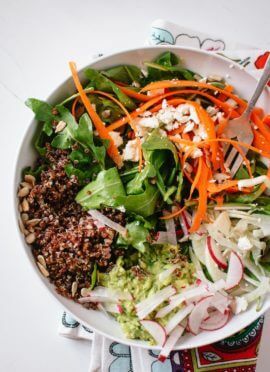 I love how light and fresh this salad is for spring! I need this salad! The dressing recipe looks delicious! I don’t see nearly enough live music… we try to go to a show each year, but it’s hard because they always start SOOOOO LATE! I would LOVE to see OK GO. Their videos are so much fun. Ahhhhhh… panzanella. The greatest creation ever. Seriously. Who came up with this brilliant idea (as I typed this, I realized that I should really look that up)? Love the addition of spring veggies here! Brightens the whole thing up. Just look at all those beautiful spring vegetables! 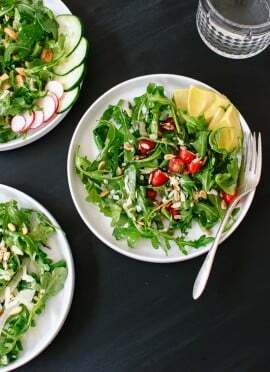 This salad sounds so delicious and refreshing. Happy Spring! I love this post and it reminded me of how great OK Go is. Your link above to the White Knuckles video also has a longer companion video of the outtakes and 4-angles of their final take (search OK Go – White Knuckles – Outtakes + 4 Angles). Have you seen? Most of the pups were rescues and it took hundreds of takes to get the final film. All of their video is fantastic, but this one always makes me choke up! Hey Anna, that video is so great! Thanks for sharing! I was wondering how they pulled that off. God, this looks divine! I love panzanella, I find the soaked and sour bread in the Italian, original (if there ever is an ‘original’ version of a recipe in Italy…) panzanella one of the greatest inventions in food, but I guess I love this crispy variation, too! Thanks, Evelyn! I’ll have to try the soaked Italian original, sounds interesting! I saw your ‘spread the love’ call on the Best of May post, and I remembered I never let you know how this salad turned out! Well, it was divine, I’m actually making it at least once a week! 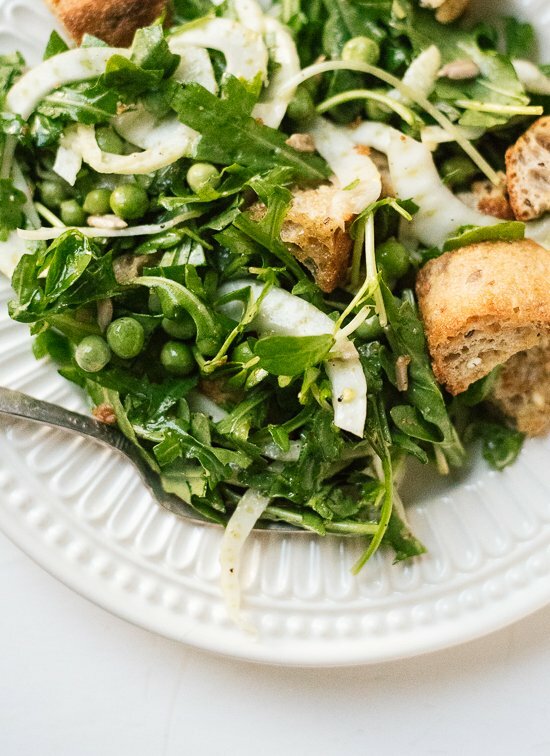 I love the raw fennel, together with the lemon dressing it makes the salad so juicy and fresh, perfect with the sweetness of the peas and the saltiness of the crispy croutons. Actually my mouth is watering again now I’m writing this, haha. Did you try the Italian version yet? It’s quite different from this salad, the vinegar-soaked bread is really bold, but it refreshes and zaps me awake (in a good way!) at the same time every time I take a bite. Oh yay, I’m so glad to read your feedback on this one, Evelyn! Thank you! I haven’t tried the Italian version yet, but I love vinegar, so I’m looking forward to it! This salad looks delicious and refreshing. I love the idea of having base recipes with seasonal variations- genius! This looks amazing! So healthy and delicious. Thanks, Alexa! Hope you both enjoy! This looks AMAZING! I’m going to make it on the BBQ so it gets a smoky flavour! That’s my fave way to do pizza. Oh man, that would be incredible! I don’t know if your Brussels will get crispy like mine, but I bet the smoky flavor will be fantastic. I’ve spent every night this past week paging through Erin’s cookbook trying to figure out what to make first! SO AWESOME. I think this panzanella is now in the running for MUST MAKE NOW. So springy! Right?! You’re going to love this panzanella, Joanna! Pea shoots? Interesting take on panzanella ;-) I just made the traditional version. Did you know that there were only onions in the original panzanella as tomatoes only became popular a couple centuries later in Italy? I didn’t know that! Very interesting!